Welcome to the web site for the Revell Research Systems Prize at the University of Plymouth. Revell Research Systems is a Management and Technology Consulting Practice based in Exeter in the South West of England that operates throughout the United Kingdom. 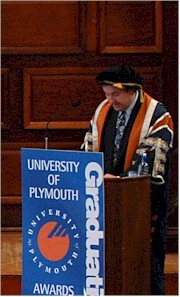 The Consultancy established the Revell Research Systems Prize at the University of Plymouth in 2006 to mark its 21st year in business. The prize is currently awarded to the top full time final year student enrolled on a BSc(Hons) programme within the cognate area of Computing at the University of Plymouth in the School of Computing, Electronics and Mathematics. The prize offers the top final year student the opportunity to stand out even further from the crowd by drawing attention to the fact that they simply were the best graduate in their year. We sincerely hope that the prize will enhance the prospects of each year's recipient as they start out with their career in Information Technology.